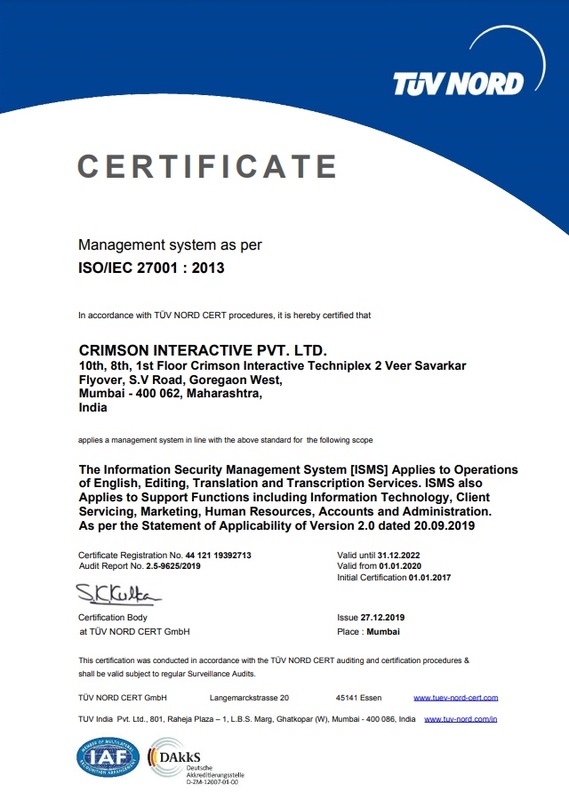 Crimson Interactive (Enago) are certified for information security (ISO/IEC 27001:2013 Information Security Management System) as well as for quality management (ISO 9001:2015 Quality Management System). We consider both aspects, viz. quality and information Security, as most critical and important for our clients. We have achieved the ISO/IEC 27001:2013 milestone for establishing robust Information Security Management System (ISMS). We adhere to the highest standards of information security, client confidentiality, and trust. Your manuscript is your most important asset and we will always treat it with the greatest integrity. ISO/IEC 27001:2013 includes management of information security in processes related to Information Technology, Client Servicing, Operations, Human Resources, and Administration. 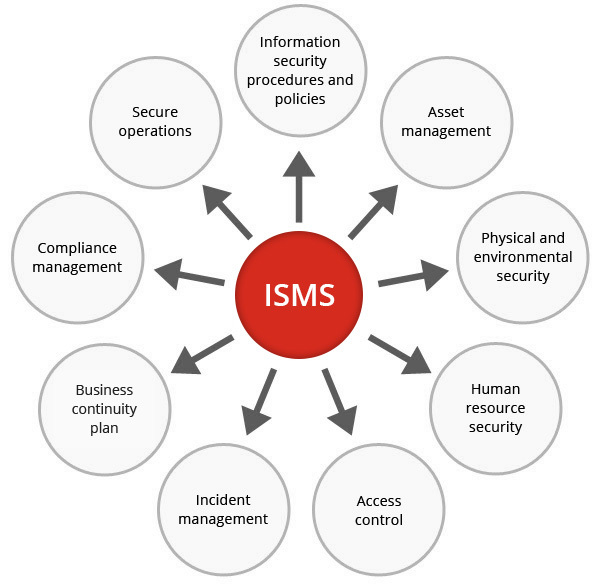 Our ISMS follows the approach of “develop, establish, implement, operate, monitor, review, maintain, and improve”. We are already an ISO 9001:2015 certified organization, and the current ISO/IEC 27001:2013 certification has further reinstated the fact that we continuously strive to ensure customer satisfaction and enhance customer experience by delivering high-quality, innovative services. 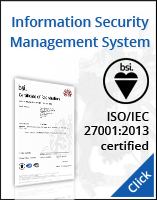 How do our clients benefit from ISO/IEC 27001:2013 certification? We have secure operations and strict compliance policies ensuring that your manuscripts are 100% safe with us. Our business continuity planning ensures there are no disruptions and that your documents are delivered on time, every time. We have a world class information technology system in place to ensure superior quality and higher security. Our trust and confidentiality commitment aims to serve you better and longer. We have globally recognized and acknowledged security processes/protocols for ensuring zero security breaches. Enago’s quality policies span the entire breadth of our operations from how we serve clients, to our recruitment procedures, to the core service of English language and science editing and its delivery. We are committed to and confident of consistently delivering high quality to our clients and guarantee standards to our work. The International Organization for Standardization (ISO) is a network of national standards institutes of 147 countries with a central secretariat in Geneva, Switzerland. The organization sets standards for companies to follow and certifies them after a successful audit of their systems and processes. In May 2006, QCert Ltd. certified Enago’s systems and processes to the ISO-9001 standard. The significance of ISO certification is two fold. First, the documentation of our operating procedures enables us to operate more efficiently. Second, the certification assures our customers that our quality standards are among the best in the world. Semi-annual independent audits are conducted to ensure that Enago continues to meet the ISO 9001:2015 standards. For an accurate pricing and delivery time for your manuscript, please fill out the quotation form below and we shall get back to you within 1 hour.